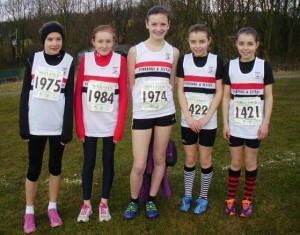 Maddy Firth-Cook, Kia Cheetham, Ellen Murgatroyd, Megan Barnsley, and Alex Barnsley. backdrop saw some fiercely contested races in spite of eventual league positions being largely per-determined. It was a particularly good day for the club’s females. The Under 15s were without star Rosie Johnson resting for the following weekend’s inter- counties but loyally present to spur on her team mates. They responded magnificently. Charlotte Mawdsley(4) and Anna Hulme(5) led and the back up of Rosie Walsh(9), Jess Gonzalez-Green(14), Lauren Powell(15) and Kate Croft(18) obliterated the opposition and emphasised their right to the ownership of the overall team title. There is equal enthusiasm among the Under 13`s with Megan Barnsley(10), Alex Barnsley(16), Kia Cheetham(19), Maddy Firth-Cook(24) and Ellen Murgatroyd(25) taking second team spot. But it wasn`t all over for the ladies. Georgina Hannaway(9) and Anna Forde (11th)performed competently as usual in the U17s but Scarlett Collins triumphed completely in the U20s category incorporated in the Senior race. Here Kirsty Longley, whose passion for simply running remains undiminished, was second and first O35 woman. Together with Bua Kalasiram(19) and Scarlett (23) they collected fourth team spot which will ensure internal promotion next season to the top division. seconds adrift. 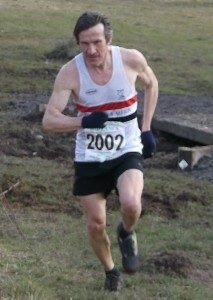 Dave recorded fifth Junior. If there were club prizes for the most improved athlete of the season he would surely be in contention. Sadly Michael Rimmer exited the European 800m championship in Gothenburg in the first round. His 1.51.04 was well below his best and the result may well be down to his inexperience indoors. He is quoted as as saying `I think the one way I was going to be caught out was if there was a slow first lap. I`ve been in a totally different phase of training to most people. There`s not much I can take from it but I`ll go back to what I was doing beforehand’.